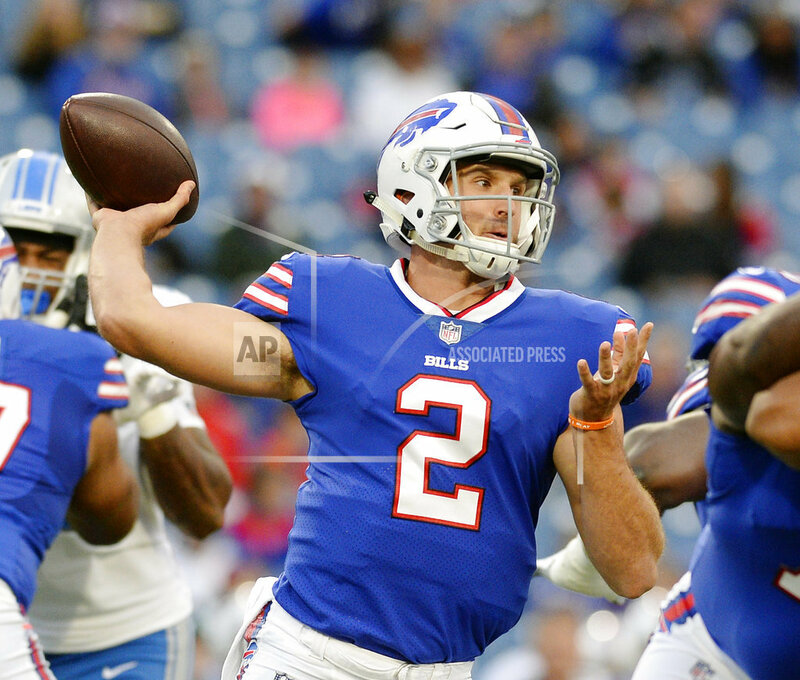 ORCHARD PARK, N.Y. (AP) — Rookie Nathan Peterman has replaced Tyrod Taylor as the Buffalo Bills’ starting quarterback in an abrupt move coach Sean McDermott said he made in a bid to improve the team. McDermott made the stunning announcement on Wednesday, when the Bills (5-4) returned to practice to prepare to play at the Los Angeles Chargers (3-6) on Sunday. The move comes after Peterman made his NFL debut in replacing Taylor for the final two drives of a 47-10 loss to New Orleans last weekend. McDermott said he reached the decision on his own Tuesday in what became a change of heart, after he backed Taylor as the starter immediately following the game and again on Monday. “This is about becoming a better team,” McDermott said. He would only say “we’ll see,” when asked if Peterman will remain the starter beyond this weekend. It made no difference to McDermott in making a switch at the team’s most important position at a time when Buffalo has a winning record while holding down the AFC’s sixth and final playoff spot. The franchise is in the midst of a 17-year playoff drought — the longest active streak in North America’s four major professional sports. Buffalo has lost two straight and Taylor has overseen an offense that ranks 28th in the NFL in yards offense and 30th in yards passing. Taylor has a 20-18 record since taking over as the Bills’ starter in 2015. Though a dynamic runner, he’s been inconsistent as a passer and is coming off the worst performance of his career. He went 9 of 18 for 56 yards and an interception against the Saints. After Stephen Hauschka capped a nine-play, 57-yard opening drive with a 37-yard field goal, the Bills never crossed midfield over their next eight possessions. The offense particularly sputtered during eight drives under Taylor in managing 99 net yards and four first downs. Peterman mopped up, going 7 of 10 for 79 yards and a 7-yard touchdown pass to Nick O’Leary over the final two possessions. Taylor is 163 of 254 for 1,684 yards with 10 touchdowns passing, two rushing and just three interceptions. Peterman was selected in the fifth round of the draft after a college career in which he left Tennessee after two seasons and finished as two-year starter at Pittsburgh. Last year, Peterman oversaw a Pitt offense that set a school record in scoring 532 points. He finished fourth in the nation in averaging 15.43 yards per completion. At 6-foot-2 and 225 pounds, Peterman has a slight height advantage over Taylor. Peterman is also more of a prototypical pocket passer than Taylor, which is considered a better fit in the offensive system installed by first-year coordinator Rick Dennison. Taylor is more of a dual threat and has been at his best when given the go-ahead to scramble out of the pocket. He set Bills records in yards rushing in each of the last two seasons, with 568 in 2015 and 580 last year. Taylor has been limited to 254 yards rushing this season. The quarterback switch continues a yearlong trend in which the Bills have been unafraid of making bold moves to reshape their team under a first-year coach in McDermott and first-year general manager Brandon Beane. Buffalo traded starting receiver Sammy Watkins and starting cornerback Ronald Darby in separate deals on the same day in August. Last month, the Bills traded their highest-paid player, defensive tackle Marcell Dareus, to Jacksonville in further transforming a roster that now features just 23 holdovers from last year.